1.4 But what about adults? The kids want to go snorkeling, but no one wants to use a mask and snorkel. You need a snorkeling raft! 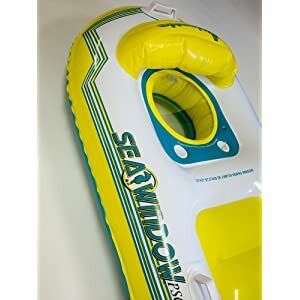 These fun flotation devices have a clear window in the bottom. The whole family can view and film all the sea life they want from the comfort of a raft. These clear bottom inflatable snorkeling rafts have special features that make being on the water even more fun for you and the kids. Let’s take a look at them now to see which one will head out to the beach with you. The Sea Window company has both the Explorer here and the Atlantis below. The Explorer is ideal for kids and teens up to 145 pounds and 5 feet tall. If your kids haven’t taken a snorkeling class, there’s no problem. They can lay face down on the raft and view the reef from the window on the surface of the water. They won’t need a mask or snorkel at all. They can even wear their prescription lenses or sunglasses. And the inflatable headrest is adjustable for perfect comfort. The clear window is made of strong, double-layered plastic. There’s a neat trick in the design that lets you choose how the window works. If you leave an air pocket between the two layers, the view below is just normal. But if you fill the space between with water, it magnifies the view up to 25%, bringing everything closer. This magnified view is handy because there is also a camera mount on the bottom of the raft. Your son or daughter can hook up their GoPro camera to film all the action under the water. Now, since this is a snorkeling raft for children, there’s always safety concerns. To make the inflatable as safe as possible for kids, there are multiple air chambers. If the raft springs a leak in one section, the rest of it should remain afloat. But springing a leak is unlikely since the raft is built from durable 12-gauge PVC plastic. This is an inflatable made for repeated enjoyment. Sure, the Explorer raft seems like a great investment, but can it travel well? If you’re wondering about size and weight, it’s pretty small and light. You can definitely fit in a luggage case. It’s shipped in a 12 by 12 by 3.5-inch thick box, and it weighs only 2.6 pounds. It seems that Sea Window carefully considered all the details of this boogie board raft. 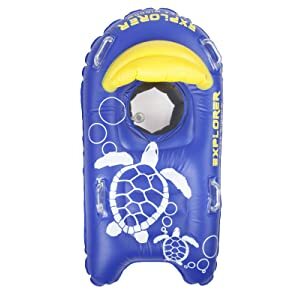 Since the Explorer only inflates up to 47 inches long by 25 inches wide, you’ll need an adult-size inflatable raft. If you’d like to accompany your child on a snorkel rafting trip, check out the Sea Window Atlantis below. Skip the snorkel and goggles on this trip. You can have fun with your own snorkeling raft, too. Sea Window created the Atlantis for adults up to 7 feet tall that weigh up to 275 pounds, but kids can use it, too. It has a clear window in the bottom of the raft just like the Explorer. This nifty two-layered window works in two ways. Leave it filled with air for a normal view of the sea floor. Or you can fill it up with water between the layers to make the coral reef below look 25% larger. This technology invented by Sea Window is called Aqua-optics, and you need to see it to believe it (no pun intended). You can wear glasses and see everything you’d miss while wearing a snorkeling mask. The Atlantis raft inflates to 29 by 82 inches in size. It has a comfy headrest to support your head while you lay face down in the bottom and watch the fish swim by underneath. The handles mounted on the front and sides of the raft make it easy to lift and carry across the beach or down to the pool. They can also make an insecure swimmer feel a little more comfortable floating on the water. If you plan to pack the Atlantis for a trip to Tahiti, it comes in a 15 by 14 by 4 inch box that weighs less than 8 pounds. It won’t take up all your luggage space at all. 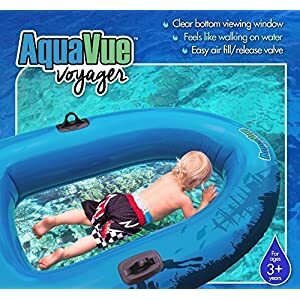 Aquavue’s Voyager is similar to the Sea Window rafts in that it also has a clear window at the bottom of the raft. But instead of a small viewing area, it’s the entire raft floor that’s transparent. This makes for an incredible experience out on the water. While this inflatable is marketed with kids in mind, it supports up to 185 pounds of weight. It inflates up to 64 inches long by 40 inches wide and 12 inches deep, large enough for an adult to enjoy. If you have a pair of oars, the raft has oar locks mounted on each side. This makes it possible to venture out without depending on a tow or paddling with your hands. And while there are no Aqua-optics to enhance a view of the ocean floor, the thrill of floating in a clear bottom raft might just be enough that Junior won’t ever want to leave the pool. These three inflatable rafts are bound to take your next trip to the pool or the ocean to a new level of fun. You can tow them like a boogie board on the ocean, or simply enjoy them at the pool. The clear bottom windows make it possible for inexperienced swimmers to enjoy a snorkel-like adventure, and even film it to share with others. Come visit us again soon to see the newest products that enhance the wonder in the world around you.